Almost Christmas and what are we having for Christmas dinner is an often asked question. 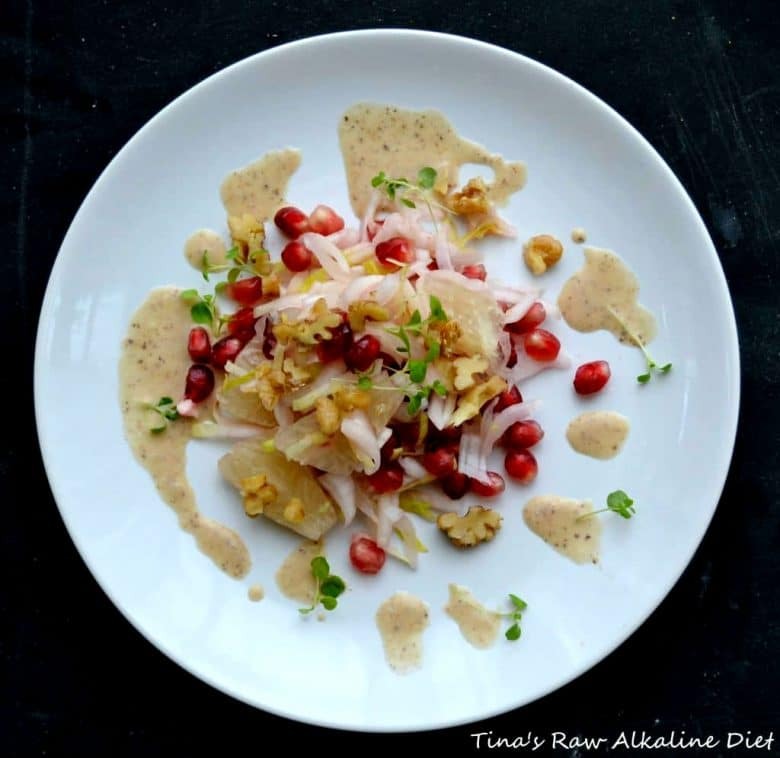 This is my raw Christmas Menu, I hope it inspires you to add at least one raw dish to yours! 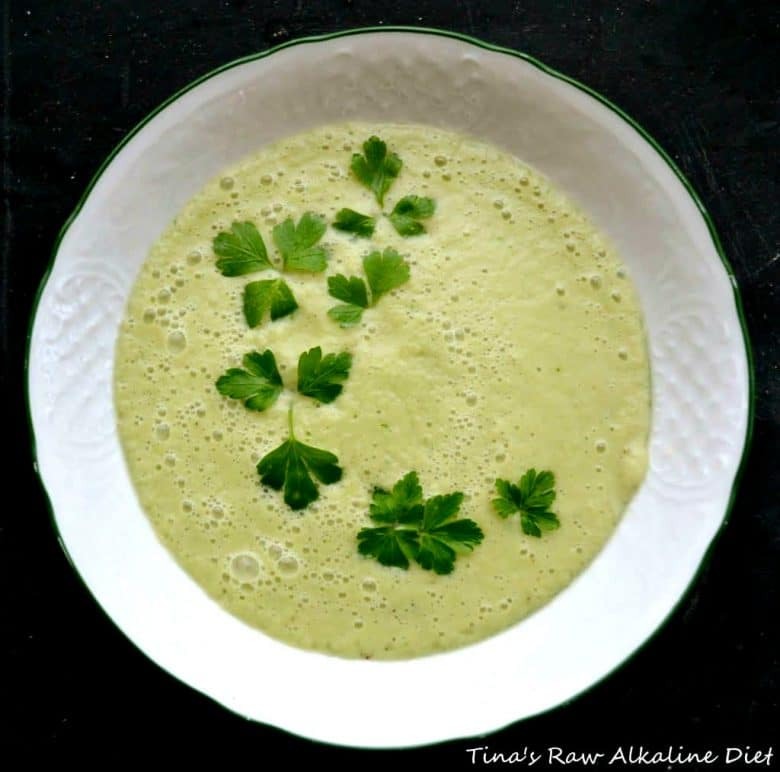 Not too difficult, something ( almost ) everybody will love, of course alkalizing, raw and so good for the body and soul. I created this menu to be enjoyed as a complete 4 course meal. 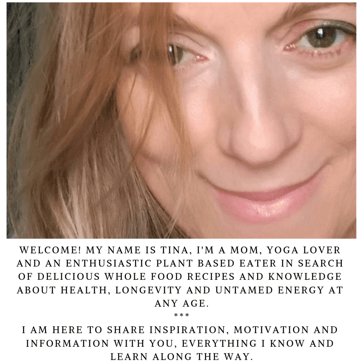 You can also pick recipes you like from it and add it to your raw, cooked or traditional Christmas dinner so loved ones can try and enjoy this great and beautiful way of eating. 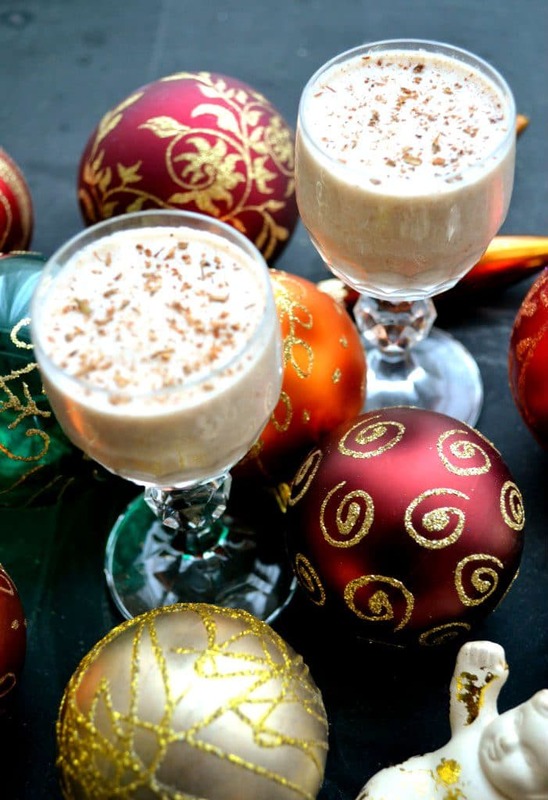 My Christmas menu is light, easy and quick to make without to much difficult ingredients. 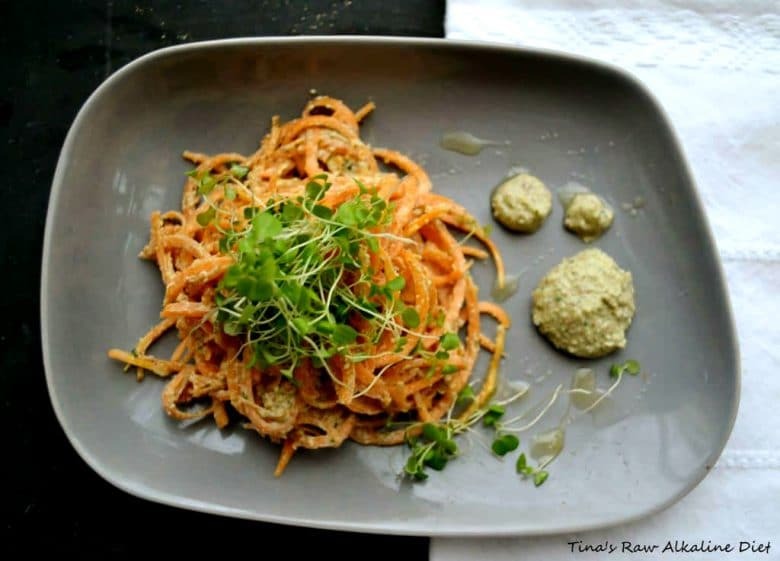 It is raw, gluten free, vegan, alkalizing, pretty on the plate, also important! I made two starters, could not choose, you don’t have to either! They are both light, pretty and tasty. Blend ingredients until smooth and creamy. A little water can be added if needed. A high speed blender makes it nice and lukewarm, which can be great when it is freezing outside! 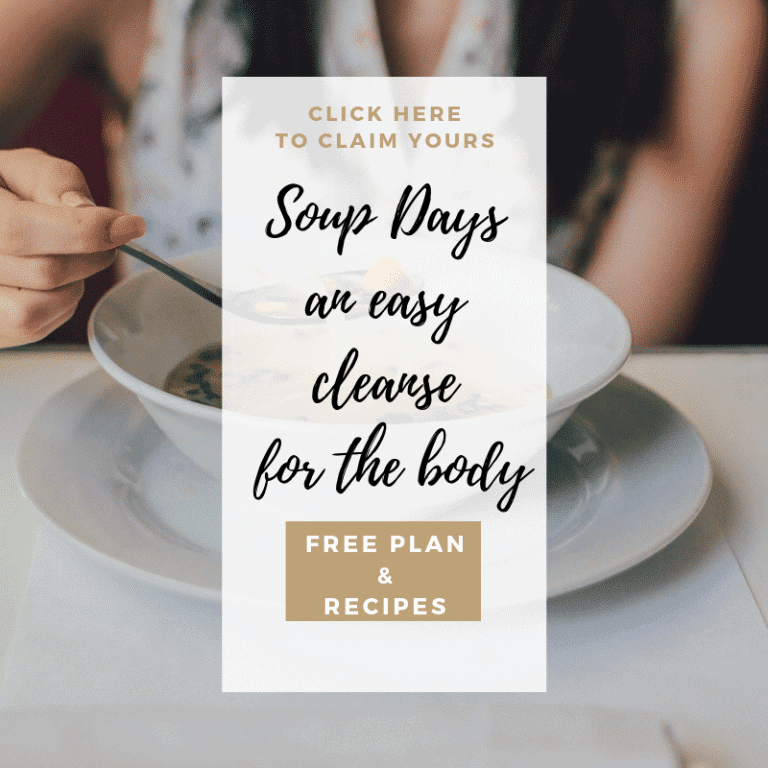 You could also warm it up a little au bain marie and serve it in a warm bowl. Garnish with parsley leaves. 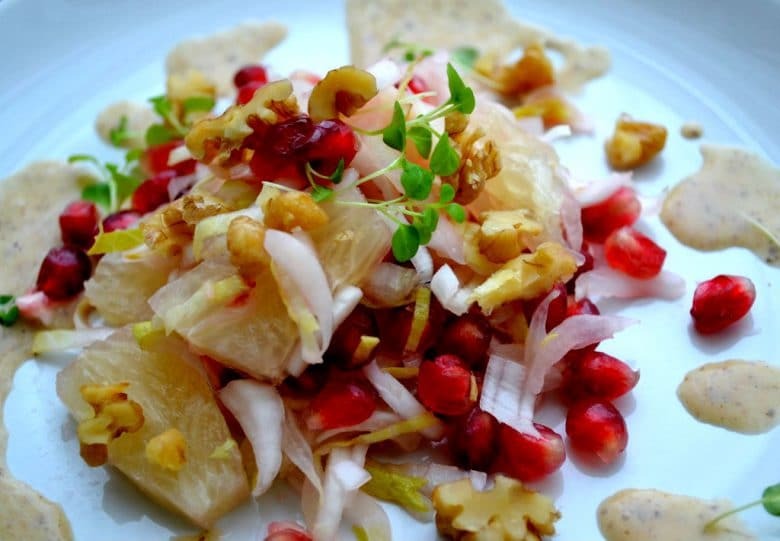 Chicory Salad with pomegranate, pomelo or grapefruit and walnut. Pomelo has a less moist texture than grapefruit. They are both slightly bitter. I do not use pomegranates often, I should though! 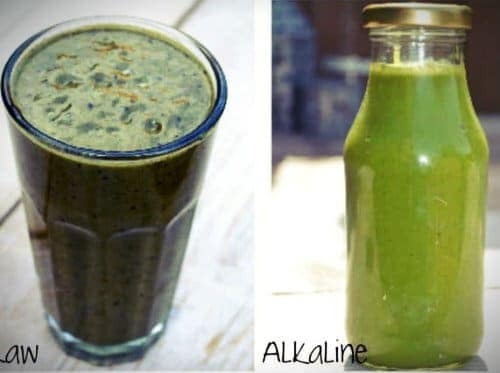 I have been experimenting with them, they are also great in smoothies and juices, loaded with anti-oxidants, great for the hart,prostate and against diabetes. Lots of vitamin C, E and folate. Great color which can be added to a Christmas dish! The cut endive should be mixed with the lemon juice right away to stop it from discoloring. Add the rest of the ingredients to the endive. I served the dressing apart to keep the colors of the salad so vivid and alive! 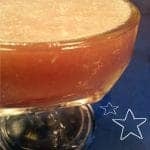 In a small blender blend it until thick and creamy or use a small whisk. Season to taste. 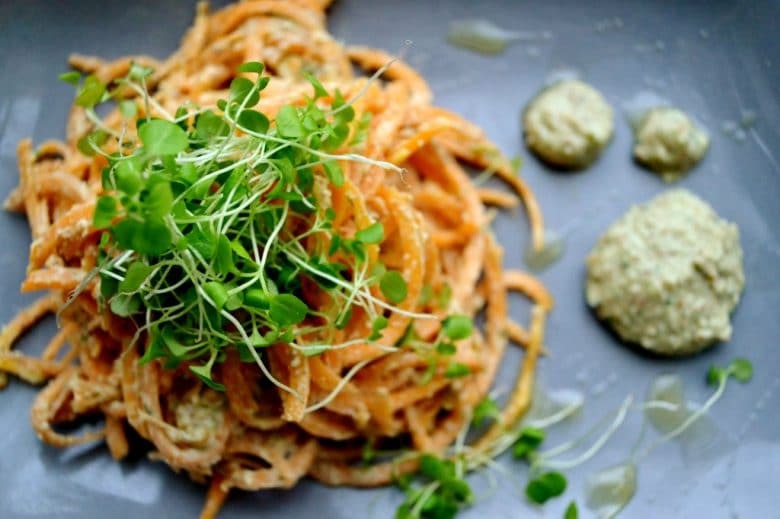 Spaghetti made of butternut squash is quick and interesting to eat and to see! Using a spiralizer it can be done in a few minutes. It can also be grated, but the mouth feel of spiralized spaghetti is much nicer. You can soak the pumpkin spaghetti overnight or for a few hours to make them softer and easier to digest, I did not do that, it also worked fine without soaking. You can substitute sweet potatoes for the pumpkin which can be enjoyed raw unlike a regular potato. 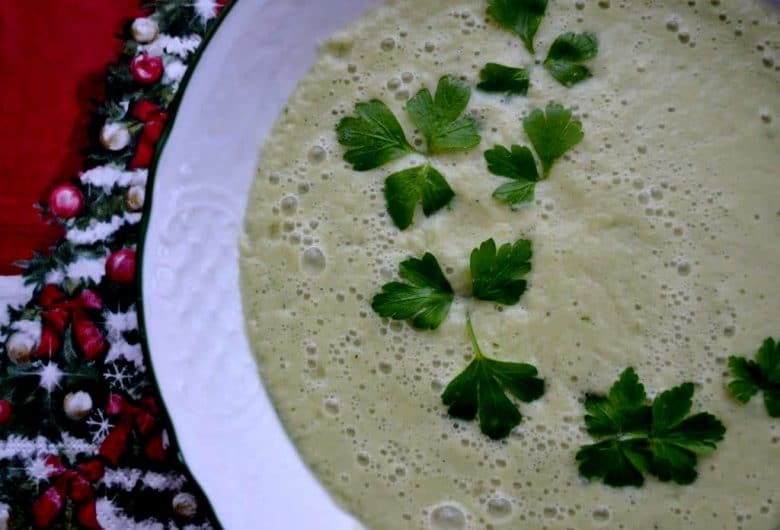 You can use a small blender or food processor to blend the ingredients of the cheese to a nice thick consistency. This could also be done by hand or in a glass jar, it should be stirred or shaken until it becomes creamy. One part of the cheese goes on the spaghetti and the rest can be served alongside the dish. It goes lovely with a big green salad, little sweet tomatoes and green olives. This dish can be prepared in advance so the cheese will soften the butternut pasta. I plated it with micro greens. These little cupcakes are so cute, the lime makes them fresh and light. The base and the topping can be prepared in advance and kept in the refrigerator for up to two days. This recipe makes about 6 to 8 cupcakes, depending on the size of the forms you are using. It can also be made as a big pie, in that case you should double or triple the recipe. All the ingredients go in a food processor and should make a nice dough. The cupcake molds can be lined with foil to make it easier to take them out when cold. Divide and press the dough in the molds and chill for a few hours in the fridge. 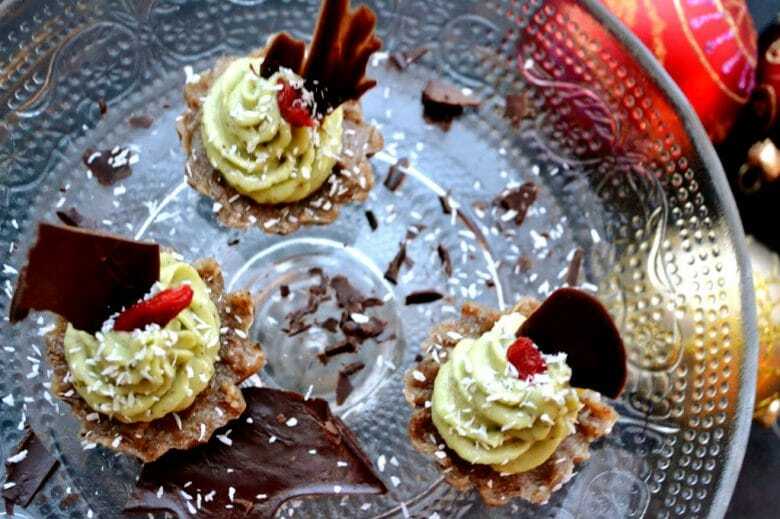 When they are cold, they can be taken out of the mold and decorated with the lime avocado topping. 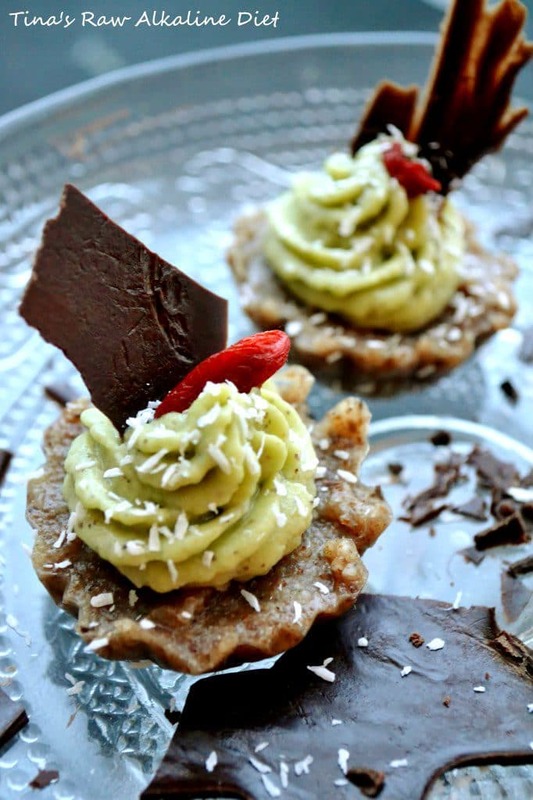 Lime Avocado topping, also great as a pudding on its own! 3 Tbsp. date paste or liquid sweetener of choice, depends on how sweet you like your sweets! Blend the ingredients until creamy and smooth in a small blender or food processor. I used a piping bag to decorate the cupcakes. I scooped the topping into the piping bag and let it stiffen a little in the refrigerator. I made some raw chocolate made of melted coconut oil, some cocoa powder, mesquite powder, vanilla powder. You can add a liquid sweetener of choice, I kept it really pure and bitter which went great with the sweet cupcake. Mix the ingredients, spread it out on a parchment paper and let it cool down in the refrigerator or freezer so it can be broken into pieces. A red goji berry and some desiccated coconut to add some X-mas spirit! something creamy and traditional with a healthy twist to finish the evening! It is a great alternative without the sugar egg, milk and cream! Everything in the blender until very smooth! 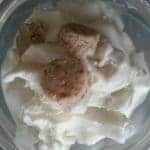 When using dried coconut I recommend to strain the nogg through a sieve or milk bag to get rid of these little pieces left in the cream. Sprinkle some cinnamon and nutmeg on top and enjoy! Do let me know how you got along! 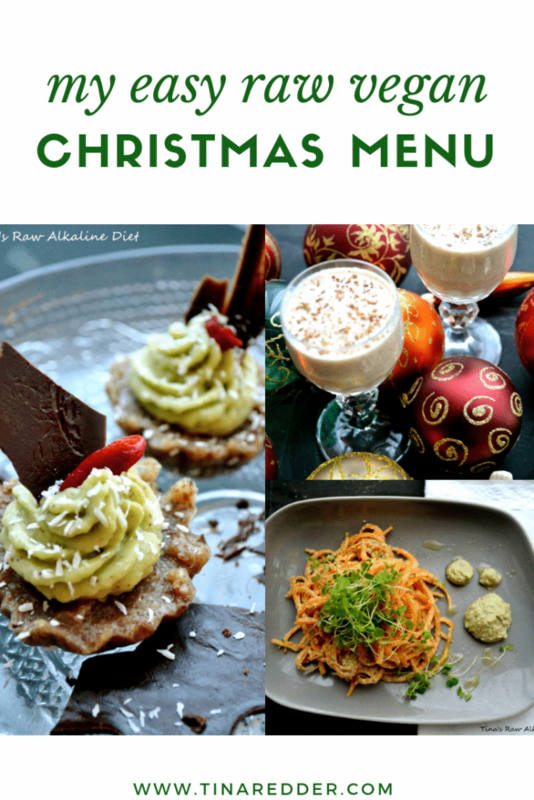 Click HERE for a high raw Christmas menu for inspiration. I wish You a warm, beautiful, peaceful and healthy Christmas! 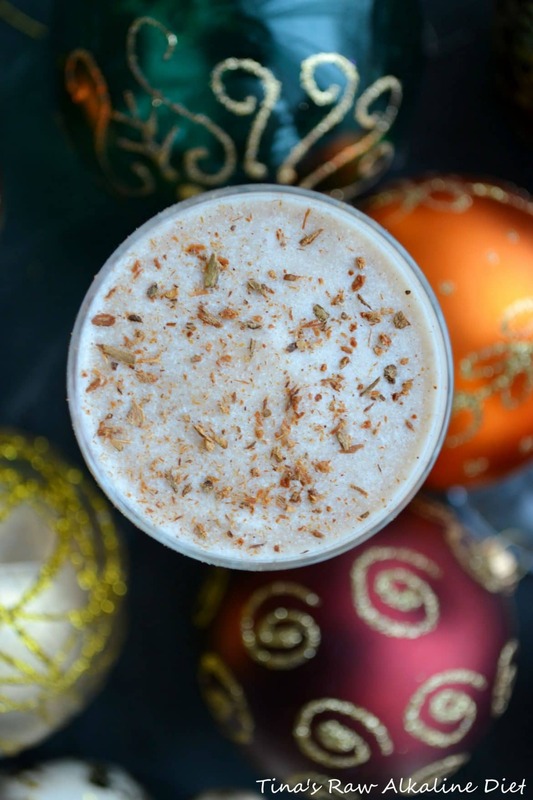 Alcohol Free Cocktails … party time!